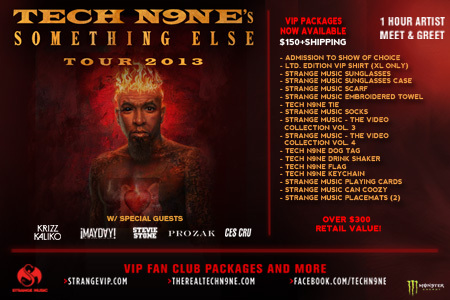 Tech N9ne always brings his tours back home with a bang, but this time he’s bringing a special friend to make the night truly Something Else. Legendary comic book and graphic novel artist Rob Prior (who you may remember as the insanely talented two-handed painter who made the Limited Edition Tech N9ne Poster) will be painting LIVE on stage during the Something Else Tour’s homecoming stop in Kansas City. You heard it right, Tech N9ne will perform the most intricate live hip hop that KC has ever seen while Rob Prior paints the proceedings from the stage. The final result will be revealed at the end of what will be another great show at the Midland Theatre. This is an event that you will only be able to see by being at The Something Else Tour in Kansas City at The Midland Theatre on October 30. What do you think about the live painting during the KC show?